we have a governor general's prize winner! 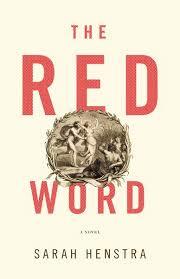 sarah henstra recently won the governor general’s prize for literary fiction for her book, ‘the red word’. she will be joining us for drinks, dinner and what we expect will be a fascinating conversation on monday january 21 at public kitchen and bar. go to the join us page for tickets. “The Red Word is the story of an epic war between two student houses on campus. One is a group of young, female students new to third wave feminism. They’re looking for ways to apply these ideas to their daily lives. The other house belongs to a fraternity whose main objective is to party. The girls in the student house have decided that fraternities are one of the biggest problems on campus and wage a campaign to get them banned. One of the things I wanted to explore in The Red Word was the murky terrain of party culture and the free-for-all that can unfold at a fraternity party. Groundbreaking and provocative, this is an astonishing evisceration of the clichés of sexual politics as they exist not only on our college campuses, but also within broader present-day society. Alternately heartbreaking, funny, and critical, no one gets off easily. The Red Word plumbs the depths of literature, mythology, history, philosophy, and a host of contemporary issues—an utterly effing good read.